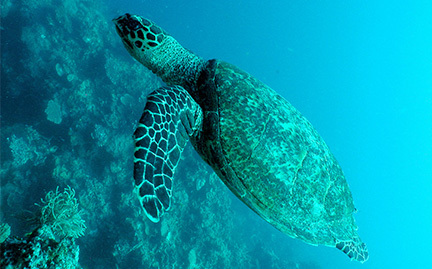 Hawksbill turtles are found throughout the world’s tropical oceans, mostly in coral reefs. They feed primarily on sponges, extracting them through narrow crevices in the reef by using their narrow, pointed beaks. By removing the sponges, they provide better access for reef fish to feed and help maintain the health of reefs.